Cornell’s 100% design development (DD) drawings for the proposed Fine Art’s Library have been completed. The scheme continues to have serious fire-safety deficiencies, continues to be non-compliant with the New York State Building Code, and continues to be problematic for non-Code reasons as well: it destroys a flexible “low-value” industrial-type building that was extremely useful for the department of architecture and replaces it with a spectacularly useless mausoleum for the display of books. You can read more of my articles and blog posts about this project here. Today, one day before the anniversary of the Triangle Shirtwaist Factory fire, I offer two more reading options: first, a detailed analysis of the latest 100% DD drawings (and Cornell’s Code variances) and second, a Cornell Chronicle parody covering the same material. 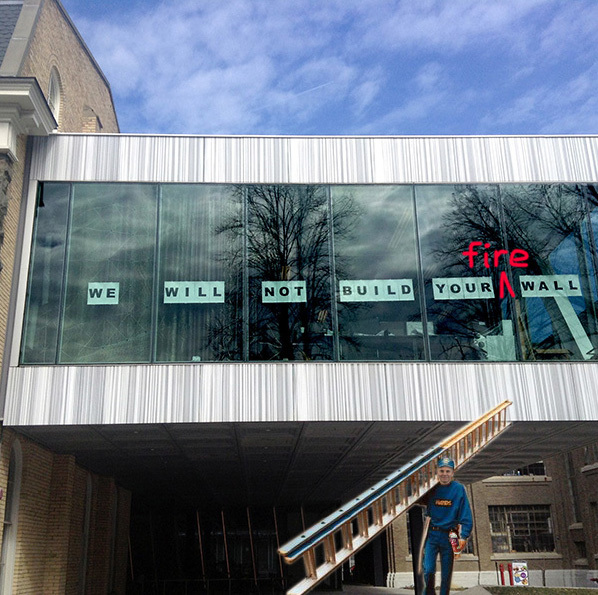 This photo accompanies my Cornell Chronicle parody. This entry was posted in Architecture, Milstein-Rand-Sibley Hall, Writings on March 24, 2017 by jonochshorn.